Hope's Cafe: Cool Weather Means Sweaters!! Don't you love this gorgeous cool fall weather?! I absolutely love fall for many reasons, but there are 2 very important reasons. First, it means the summer heat is over, and I am always ready for 60-degree days. Secondly, it means I can pull out my favorite pieces of apparel-sweaters! Womens sweaters are the best way to complete your look. I love how the perfect sweater can make any outfit look good. For example, if I'm heading out for lunch with friends, topping my favorite denim skirt with a dressy sweater makes for a great "dressy casual" look. Or if I'm preparing for Church or another dressed-up event, the right sweater will be the finishing touch! No matter what the occasion, I always feel ready for anything when I'm wearing a sweater or cardigan. 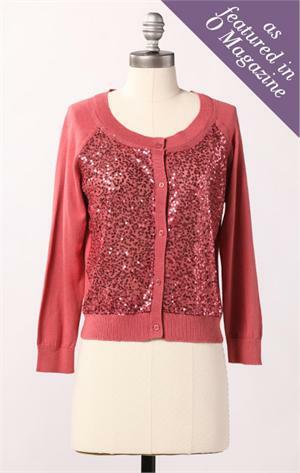 For example, check out this Sequined sweater below. Wouldn't this be perfect for Church next Sunday, matched with a black skirt or over a rose-floral patterned dress? 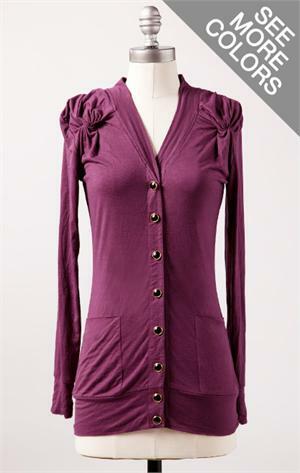 I also love this Knot Alone Cardi. The knotted details on the shoulders are so cute! It also has those can't-live-without pockets! Of course, the deep purple shade adds another level of enjoyment for me, since purple is fast becoming my favorite color! wow, both of these you have selected are so beautiful. I love that red sweater, which would be perfect for any holiday occasion. I love sweaters and enjoyed your post about them. The sweaters are very pretty! I'd love to add them to my wardrobe! I love sweaters and enjoyed reading your post, this is the perfect time of year to start wearing them, I think winter cloths are so pretty. I love the red sweater it is very pretty. I love Fall! It is definitely my favorite time of the year. And I love to wear sweaters--so cozy! Thanks for the review.